Kaiser Chiefs are an English indie rock band from Leeds who formed in 2000 as Parva, releasing one studio album, 22, in 2003, before renaming and establishing themselves in their current name that same year. 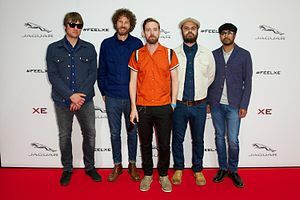 Since their formation the band consists of lead vocalist Ricky Wilson, guitarist Andrew "Whitey" White, bassist Simon Rix, keyboardist Nick "Peanut" Baines and since 2013 drummer Vijay Mistry, who replaced founding drummer Nick Hodgson who left the band in late 2012. Primarily inspired by new wave and punk rock music of the late 1970s and 1980s, the band have released six original studio albums: Employment (2005), Yours Truly, Angry Mob (2007), Off with Their Heads (2008), The Future Is Medieval (2011), Education, Education, Education & War (2014) and Stay Together (2016) one EP Lap of Honour (2005), one compilation album Souvenir: The Singles 2004–2012 (2012) and numerous singles, including the number one hit song "Ruby", which was written by Ricky Wilson's cousin Simon Robinson. Their album Employment enjoyed critical and commercial success with over three million copies sold. It has won the band three Brit Awards, including the award for Best British Group, a NME award for Best Album, and was shortlisted for the Mercury Prize. Their UK hit singles include 2004 and 2005 number 9 hit "I Predict a Riot", 2007 UK number 1 hit "Ruby", which has sold over 461,000 copies, from their platinum album "Yours Truly, Angry Mob" plus a further two Top 20 singles in 2007 with "The Angry Mob" and "Everything Is Average Nowadays". In 2008, they had a UK number 5 hit with the post-punk revival track "Never Miss a Beat". In total, the band has sold over 1.1 million singles combined up to their 5th album. Their latest top 40 single, "Coming Home" hit number 31 in 2014. Their album Education, Education, Education & War hit number one in the albums chart also in 2014. When they were around eleven years old, Nick Hodgson, Nick Baines and Simon Rix met in the same class at St. Mary's Catholic High School, Menston, West Yorkshire. After leaving school, Rix and Baines left for university in 1996 whereas Hodgson remained in the Leeds area, meeting both Andrew White and Ricky Wilson. Hodgson, White and Wilson formed the band Runston Parva, its name a deliberate misspelling of a small East Yorkshire hamlet called Ruston Parva. After Runston Parva failed to secure a record deal, the group re-formed as Parva upon the return of Rix and Baines from university. Parva's career went beyond the boundaries of Leeds, and the band was able to obtain both a record and publishing deal. However, after Beggars Banquet closed the Mantra label, Parva were dropped and left desolate and without any direction after the release of an album (22) and three singles ("Heavy", "Good Bad Right Wrong" and "Hessles"). According to manager James Sandom in an interview with HitQuarters, as a dropped band they had become damaged goods, "No one would touch them because they had a history. A lot of people used their history against them." The band decided that they would aim for a longer term record deal and started afresh with new songs and a new name: Kaiser Chiefs. The new name was taken from South African football club Kaizer Chiefs, the first club of ex-Leeds United captain Lucas Radebe. Manager James Sandom was tipped off about the band by Drowned in Sound founder Sean Adams and persuaded him to go and see them live. Sandom said: "I went to see a couple of shows and you were just bombarded by a series of potential hit singles." Soon after Sandom became their manager, Kaiser Chiefs signed to B-Unique Records. Atlantic Records had also made an offer for the band. In July 2004, while still relatively unknown inside the UK, Kaiser Chiefs performed their first festival outside the UK at a festival in Moscow. One of the major factors in the band's breakthrough in 2005 was their involvement in the NME Awards Tour at the beginning of the year. Like Coldplay and Franz Ferdinand before them, their position as opening act proved an influential one, attracting a lot of positive media attention. The first single released from the album was "Oh My God" in 2004, which reached number six on the UK singles chart when it was reissued in February 2005. In 2007, the song was covered by Mark Ronson and Lily Allen for Ronson's album Version. "I Predict a Riot" soon followed as the album's second release. In 2007, the song was ranked number thirty-six on the NME "Greatest Indie Anthems Ever" countdown. The top twenty singles "Everyday I Love You Less and Less" and "Modern Way" followed in late 2005. The band opened and performed several of their singles at the Philadelphia Live Eight concert in 2005. The song "Saturday Night" was featured in a pre-release video for the Xbox 360 gaming console. It was posted on the official Xbox 360 page before its launch. In 2006, the band received NME awards for 'Best Album' for Employment and 'Best Dressed' for Ricky Wilson. Kaiser Chiefs' second album Yours Truly, Angry Mob was released in February 2007. The group recorded the album throughout the September and October 2006 at Hook End Studio in Oxfordshire, England. The group took inspiration from Led Zeppelin and American rock music, and recorded over twenty-two songs. Yours Truly, Angry Mob reached number one on the UK albums chart and number forty-five on the Billboard 200 albums chart. The album went on to be the band's second Million Seller including the UK and European #1 Airplay Hit of 2007 "Ruby". 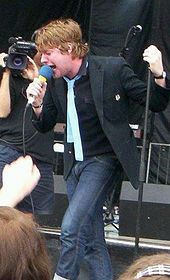 "Ruby", the album's lead single, became Kaiser Chiefs' first UK number one single and received the 2007 'Q Award' for 'Best Video'. "Everything Is Average Nowadays" was released as the album's second single, and reached No. 19 in the UK. The album's third single "The Angry Mob", described by The Sun as a "clever, accessible pop" song, peaked at number twenty-two in the UK. The fourth single, "Love's Not a Competition (But I'm Winning)", was released on 12 November as a collector's edition 7" only single via their website. In December 2007, Kaiser Chiefs played two sold out shows at Earl's Court in London to a capacity crowd of 30,000. On 4 August 2008, the band confirmed the name of their third album as Off with Their Heads. It was released on 20 October 2008. The first single "Never Miss a Beat" was released on 6 October 2008. The band also released a DVD of their live performance at Elland Road from 24 May where they played to a sold out capacity crowd of 40,000 people. The DVD contains the full set from the home of Leeds United as well as highlights from the Kaiser Chiefs performance for the 2007 BBC Electric Proms. Kaiser Chiefs set out on a UK tour in October 2008 with Castle Donington band Late of the Pier and The Hair. The tour started at Leeds Academy, a new venue where they were the first headlining band to play. Other dates included Manchester Academy, Southampton Guildhall, Reading Rivermead, Glasgow Barrowlands, Leicester De Montfort Hall and London Forum. Kaiser Chiefs headed out on a UK Arena tour between February and March 2009, kicking off in Nottingham and ending in London. The tour visited Sheffield, Birmingham, Edinburgh, Aberdeen, Newcastle, Manchester, Liverpool, Cardiff and Dublin. This was the new album tour to promote Off with Their Heads. The band featured on several shows over Christmas 2008 including performing "Never Miss a Beat" with Girls Aloud on their TV Special and playing the same song on the Christmas Day edition of Top of the Pops. On 16 July 2009, they played at Marés Vivas in Vila Nova de Gaia, Portugal as headliners on that day. They, along with Republic of Loose, opened for U2 in Croke Park in Dublin on 25 July 2009. 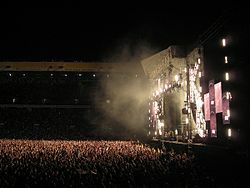 They then opened for Green Day from 27 July to 7 August 2009, and the final shows before their 2-year hiatus were performed at Reading and Leeds Festival 2009. Following a hiatus, Kaiser Chiefs announced that they expected to release their fourth studio album in mid-2011. The album was recorded over a period of eighteen months at various locations including drummer Nick Hodgson's self-built east-London studio. The album's producers included Tony Visconti, Ethan Johns and Owen Morris, in addition to Nick Hodgson himself. On 3 June 2011, Kaiser Chiefs launched their new album from their website. Using a create-your-own album technique, fans were able to choose 10 out of 20 songs to create "their album" for £7.50; the band provides streams of roughly one minute to preview each track before selection. Many celebrities including, Radio One DJ Chris Moyles, The Guardian Newspaper, and frontman Ricky Wilson, created their own version of the album, donating the £1 reimbursement for each copy sold to the Alzheimer's Society. On 27 June 2011, Kaiser Chiefs released an official track listing for the album, featuring 12 of the 20 available tracks and including a previously unheard track 'Kinda Girl You Are' which did not make the initial launch as it was not ready in time. They played two sell out comeback gigs at Falmouth Princess Pavilion. Then followed by appearances at Germany's Hurricane and Southside Festivals in June, Switzerland's Gurten Festival, Pinkpop in The Netherlands, Belgium's Rock Werchter, Portuguese festival Optimus Alive! in July, V Festival in August, Hard Rock Calling in June, the Isle of Wight Festival in June and at Terres Rouges Festival in Luxembourg in September. They also played at Tennants Vital in Bangor, Northern Ireland and in September they played two sold out home town shows at Kirkstall Abbey in Leeds. They also be played in October in Festa das Latas, Coimbra – Portugal. On 6 March 2012 the album was re-released under the title Start The Revolution Without Me for the US market. The track list differs significantly from the initial release, including the track "On The Run", which is exclusive to the US album and served as its lead single in early 2012. In early 2012, Kaiser Chiefs played a 20 date tour of the United Kingdom, followed by a tour of North America. Kaiser Chiefs released their first compilation album, Souvenir: The Singles 2004–2012, in the UK on 4 June 2012. The album features all of the singles released by the band from 2004 to 2012, as well as a new track titled "Listen to Your Head". Drummer Nick Hodgson revealed via his Twitter account on 4 December 2012 that he had left the band to concentrate on other projects. The band later issued a statement on their website confirming this. On 7 February 2013 it was announced that Vijay Mistry from the band Club Smith will now be joining as Kaiser Chiefs drummer for 2013. The band were one of two support bands for Green Day's one-off concert at the Emirates Stadium in London on 1 June 2013 along with All Time Low. The band's UK tour included 13 shows, beginning at Carlisle Sands Centre on 11 February and ending at London's O2 Academy Brixton on 1 March. The run of shows also includes gigs in Glasgow, Dunfermline, Manchester, Bridlington, Newcastle, Preston, Cheltenham, Wolverhampton, Southampton, Margate and Cambridge. They then went on to headline one of the Eden Sessions at the Eden Project, Cornwall. They played a hometown concert at the First Direct Arena in September 2013, being one of the first artists to perform at the new venue. The band's fifth studio album, titled Education, Education, Education & War was released on 31 March 2014. Education, Education, Education & War is the first album featuring the new Kaiser Chiefs drummer, Vijay Mistry, after Nick Hodgson left the group in December 2012. The album was produced by Ben H. Allen III (who has previously worked with Gnarls Barkley, Animal Collective, and Deerhunter), and recorded at The Maze Studio in Atlanta. Three songs were co-written with Fraser T Smith (CeeLo Green, Adele). It was mixed by Michael Brauer (My Morning Jacket, Coldplay) at Electric Lady Studios in New York City in November 2013. On 5 December 2013, Kaiser Chiefs released a song titled "Misery Company" onto their SoundCloud account. The song had previously been performed live during the band's 2013 summer tour. On 3 January 2014, "Bows & Arrows" premiered on Rolling Stone magazine's website. The band have announced a string of live dates including two UK shows at Gorilla club and in the Scala club, as well as more shows in Madrid, New York, Mexico City and Los Angeles. They also have announced a few arena shows in Germany, and Kaiser Chiefs will be playing a few gigs in 2015 at The O2 Arena in London, the First Direct Arena in Leeds and a few appearances at various music festivals. In 2015, they released the single "Falling Awake" and performed in South America, supporting Foo Fighters. Stay Together, the band's sixth studio album, was released on 7 October 2016. It was co-written and produced by Brian Higgins, whose production company Xenomania has worked with the likes of Girls Aloud and Little Mix. The album's name is a reference to the song "We Stay Together". The first single from the album, "Parachute", was released on 14 June 2016. The second single, "Hole In My Soul" was released 18 August 2016 and the third and final single, "We Stay Together" was released on 9 December 2016. In July 2005 they were chosen to open Bob Geldof's Live 8 festival in Philadelphia; their performance was broadcast by satellite to every Live 8 venue around the world, giving the band massive worldwide exposure. In August 2006, the band released a book entitled A Record of Employment, which along with photos by Peter Hill, documented the band's rise from being unsigned to their triumph at the Brit Awards that year, where the band won awards for 'Best British Band','Best Rock Act' and 'Best New Artist'. Later a DVD entitled Enjoyment, which documented concerts from the first album era was released, this showed members of the band hypothetically interviewed when 'jaded rock stars'. In October 2008, they also appeared on MTV Day, in Greece, along with bands like the (Greek) C-Real, REM and the singer Gabriella Cilmi. During an appearance on the Late Show with David Letterman, David Letterman spoke to Nick Hodgson about buying the Kaiser Chiefs drum set after a brief discussion between the pair an undisclosed price was agreed. At the end of the Kaiser Chiefs show at Chicago's House of Blues (19 April 2012) Nick Hodgson announced this was the final show for his drum kit, which was to be sent to David Letterman. On 12 August 2012, the band was featured in the closing ceremony of the London 2012 Olympics, playing "Pinball Wizard" by The Who. On 19 September 2014, BBC Look North broadcast details informing viewers of a forthcoming concert at The New Adelphi Club in Hull, East Yorkshire, England by the Kaiser Chiefs. Simon Rix stated, "In our 13 years on the UK touring scene we've never had the chance to play the legendary, Hull Adelphi. It's a massive hole in an illustrious career. Smaller venues are so important to supporting new music but with many around the country closing down, it’s great to see the Adelphi celebrating its 30th birthday. We're looking forward to finally playing there”. A film capturing Kaiser Chiefs performance was made, which was shown at the Adelphi in January 2015 as part of Independent Music Venue Week. In October 2015, the film was screened at the 2015 Tucson Film & Music Festival in Arizona, United States. On 10 December 2014, they were the opening act for the first Foo Fighters concert in Cape Town, South Africa. And on 26 June 2015, they were an opening act for The Who at BST Hyde Park. At T in the Park 2016, they played the Radio 1 Stage. ^ a b "Kaiser Chiefs". Allmusic. Retrieved 30 November 2014. ^ "BBC – Seven Ages of Rock "What the World Is Waiting For"". Seven Ages of Rock. 2007. Retrieved 2 March 2011. ^ a b Michaels, Sean (5 December 2012). "Kaiser Chiefs songwriter leaves band". The Guardian. Retrieved 5 December 2012. ^  Archived 11 September 2007 at the Wayback Machine. ^ "Brit Awards 2006: The winners". News.bbc.co.uk. Retrieved 27 September 2014. ^ "ShockWave NME Awards : Full List of Winner 2006". Nme.com. Archived from the original on 12 January 2012. Retrieved 15 June 2011. ^ a b Heather Phares. "Employment > Review". Allmusic. Retrieved 14 September 2007. ^ a b "Antony and Johnsons win Mercury". News.bbc.co.uk. Retrieved 27 September 2014. ^ a b Official. "Official charts". Retrieved 23 August 2014. ^ "BBC Leeds – Musical Map of Leeds". Bbc.co.uk. Retrieved 27 September 2014. ^ a b c "Interview with James Sandom". HitQuarters. 28 May 2007. Retrieved 17 November 2010. ^ Sterry, Mike (6 December 2004). "The Ordinary Boys/Kaiser Chiefs : Liquid Rooms, Edinburgh, Wed, Oct 6". NME. Retrieved 9 March 2013. ^ a b "SHOCKWAVES NME AWARDS 2005". SHOCKWAVES NME AWARDS 2005. Retrieved 15 June 2011. ^ "Employment by Kaiser Chiefs". Metacritic.com. Retrieved 27 September 2014. ^ "Employment Music Charts: Kaiser Chiefs". Acharts.us. Retrieved 27 September 2014. ^ British platinum certification for Employment. British Phonographic Industry. 17 February 2006. Retrieved 14 September 2007. ^ "Ivor Novello". NME IVORS NEWS. Retrieved 15 June 2011. ^ "The Greatest Indie Anthems Ever – countdown continues". NME.COM. Retrieved 27 September 2014. ^ "The Kaiser Chiefs discuss new album". NME.COM. 20 October 2006. Retrieved 27 September 2014. ^ "Yours Truly, Angry Mob Music Charts: Kaiser Chiefs". Acharts.us. Retrieved 27 September 2014. ^ "Yours Truly, Angry Mob by Kaiser Chiefs". Metacritic.com. Retrieved 27 September 2014. ^ "Ruby Music Charts: Kaiser Chiefs". Acharts.us. Retrieved 27 September 2014. ^ Q Magazine. "Q Awards 2007". Kaiser Chiefs Best Video. IPC. Retrieved 15 June 2011. ^ "Everything Is Average Nowadays Music Charts: Kaiser Chiefs". Acharts.us. Retrieved 27 September 2014. ^ "The Angry Mob Music Charts: Kaiser Chiefs". Acharts.us. Retrieved 27 September 2014. ^ Click Music News. "Kaiser Chiefs add second London date". Click Music News- Kaiser Chiefs add second London date. Retrieved 15 June 2011. ^ Earl's Court Public Event. "ECO Public Event Space". ECO Public Event Space. Retrieved 15 June 2011. ^ "Kaisers reveal Off With Their Heads LP". Digital Spy. 4 August 2008. Retrieved 4 August 2008. ^ Amazon. "Live At Elland Road". Kaiser Chiefs Live At Elland Road. Amazon. Retrieved 15 June 2011. ^ "Home – Leeds Festival 2011". Leedsfestival.com. Retrieved 21 July 2011. ^ Peter, Paphides (3 June 2011). "Kaiser Chiefs But Under Your Control". Kaiser Chiefs The Future Is Medieval. London: The Guardian (www.theguardian.com). Retrieved 15 June 2011. ^ "The Kaiser Chiefs Self-Release 'The Future Is Medieval'". The Sentamentalist Magazine. The Sentamentalist Magazine. Retrieved 15 June 2011. ^ "Kaiser Chiefs support Alzheimer's Society with the launch of their new album". Kaiser Chiefs support Alzheimer's Society with the launch of their new album. Alzheimer's Society. Retrieved 15 June 2011. ^ "Kaiser Chiefs New". Kaiser Chiefs Band News. Kaiser Chiefs.com. Retrieved 15 June 2011. ^ a b "Kaiser Chiefs Announce US Album/Tour". Retrieved 23 January 2012. ^ "Kaiser Chiefs Announce UK Tour". Retrieved 23 January 2012. ^ "Drummer Nick Hodgson Leaves Kaiser Chiefs". Thisisfakediy.co.uk. Retrieved 13 December 2012. ^ "Band statement on Nick's departure | News". Kaiser Chiefs. Retrieved 13 December 2012. ^ "Leeds Kaiser Chiefs return home to play Leeds arena | Calendar - ITV News". Itv.com. 27 November 2012. Retrieved 13 December 2012. ^ "Education, Education, Education & War by Kaiser Chiefs". iTunes. Retrieved 6 January 2014. ^ a b Corner, Lewis (10 December 2013). "Kaiser Chiefs debut new song 'Misery Company' - listen". Digital Spy. Retrieved 6 January 2013. ^ "Kaiser Chiefs announce new album – watch". NME. 3 December 2013. Retrieved 3 January 2014. ^ Martins, Chris (3 December 2013). "Kaiser Chiefs Preview Fifth Album 'Education, Education, Education & War'". Spin. Retrieved 3 January 2014. ^ "KAISER CHIEFS Announce New Album Out April 1st. Pre-Order Now". ATO Records. 3 December 2013. Retrieved 6 January 2014. ^ "Kaiser Chiefs unveil new track 'Misery Company' – listen". NME. 10 December 2013. Retrieved 6 January 2013. ^ "NME News Kaiser Chiefs announce new album – watch - NME.COM". NME.COM. 3 December 2013. Retrieved 27 September 2014. ^ "Tour". Kaiser Chiefs. Retrieved 27 September 2014. ^ Radiox.co.uk. "LISTEN: KAISER CHIEFS UNVEIL PARACHUTE SINGLE | Radiox.co.uk/". Radiox.co.uk. Retrieved 2016-06-13. ^ NME.COM. "Kaiser Chiefs working on new album of love songs | NME.COM". NME.COM. Retrieved 2016-05-07. ^ Trefor, Cai. "Kaiser Chiefs' Ricky Wilson Opens Up About New Album Stay Together". Gigwise. Retrieved 13 October 2016. ^ "R.E.M, Kaiser Chiefs, C:Real & Gabriella Cilmi". MTVGreece.gr. Retrieved 21 July 2011. ^ "VIDEO: What a Riot! Kaiser Chiefs play gig at tiny Hull venue The New Adelphi Club". Daily Star. 5 October 2014. Retrieved 16 February 2016. ^ "Kaiser Chiefs Live At The Hull Adelphi". Codhead.co.uk. Retrieved 16 February 2016.